Today (26th October 2014) we heard that a local faith-group is seeking to hire the historic Church of the Holy Rude on Hallowe'en for a prayer meeting to counter the 'damage' likely to be done to Stirling by Hallowe’en celebrations in general and next week's Scottish Paranormal Festival in particular. That the official Lauch party for the Festival was publicised as occurring at Cowane’s Hospital – just next door, with Press and TV coverage likely – is an odd coincidence. To say the least. I don't often make personal comments on these pages, but I feel the need to do so in this case. Clearly the protesters haven't read the Programme, as the festival isn't advocating or seeking to advance any occult agenda, and as a member of the Festival Committee - committed to a belief that all faiths and worldviews (sacred, secular and scientific) are worthy of consideration and respect - I have insisted that sceptics and a wide diversity of faith systems are represented alongside believers in everything from Nessie to the Falkirk Triangle. Does their church have a position, I wonder, on the Chupacabras? The medium Gordon Smith and a number of other participants in the programme are, themselves, of the Christian faith. Indeed, that faith is the core of their belief in experiences beyond the mundane. I'm not a person of faith. But I’m straying from the point. I do that. 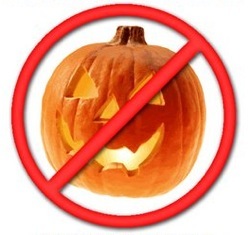 Over the years I’ve heard all manner of nonsense spoken about Hallowe’en. I was told, straight-faced, by one lady that it was ‘Satan’s birthday’, 'The Devil's Holiday' and a time of ‘pagan sacrifice’, used, still, by Witches to lure the faithful into ‘dark practices’. Nonsense, on so many levels. First and foremost, the archetype of the warty old witch, fulminating foul deeds over her cauldron is a fiction, and always has been: a Mediaeval demonisation of older religious practices by less tolerant faiths. Ironic, given that so many mainstream religious rituals and festivals have their roots firmly planted in pagan tradition. Some, today, still claim to be Witches and carry out enchantments - but argue that theirs is a benign faith. Modern Wicca appears to have evolved somewhat from it's primitive roots...even if the views of those who hold to the cackling caricature of the broomstick-riding hag have not. A few years ago a sculptor friend was exhibiting at the Glasgow pagan festival 'Witchfest'. Outside religious protestors ranted and railed about the 'Dark Arts' and how that festival would lead the city's population to ruin...while, in the background, an Orange March was prompting furious cat-calls from other denominations - those who cling to the sectarian past in my beloved native city, believe me, need no help from The Devil to cause division and strife! The irony of this, of course, seemed lost on the witch-baiters. I cannot comment on the theology of modern Wicca, but the only offensive act I noted from their number on the day in question was when one aged hippy (gasp) put a sweetener in my herbal tea! The horror! I don't hold to their faith, any more than I do to any other religious orthodoxy, but saccharine in a Camomile infusion....that's one potion I can do without! Rambling, again. So...on to Hallowe’en. Forget silly John Carpenter movie franchises and 'Trick-or-Treating' - a commercial American twist, distorting ancient traditions - the roots of the festival as we know it today are clearly Christianised evolutions of much older Celtic rites. 'Hallowe’en' is, itself, a word of Scots derivation – a late 18th-century contraction of ‘The Hallowed Evening’, by which All Hallow’s Eve was known in the church calendar, and the first night of Allhallowtide – a festival dedicated to honouring the dead...NOT venerating demons or devils...the traditions of which endure into the 21st-century in parts of Scotland and Ireland. Basically....sticking two fingers up at The Big Bad! It has than common with (and is, arguably evolved from) the pagan Samhain, a liminal point in the calander which observed the end of the harvest season and the coming of winter – and the coming, too, of long, dark and potentially dangerous nights. Fear of the dark and what lurks within it is, it seems, a universal constant among early civilizations the world over. Bonfires were set to hold back the night, and to welcome the Aos Sí or (in the Scots Celtic tradition) Daoine Sidhe - spirits of the ancients, or of honoured ancestors - to their family homes, offerings of food and wine left for them. Despite what many modern faith-based critics claim, there is NO EVIDENCE WHATEVER of blood sacrifice as part of these celebrations. If such evidence CAN be provided, I'd love to see it. The idea that Druids held this as a festival of Evil during which they would honour their Satanic master is patently ludicrous. Sacrifice is common, even in pockets of the early Christian church, but even in the brutal, bloody past it served very particular symbolic purposes: sacrifices in nature-venerating religions the world over were made to propitiate bounty and good fortune, and therefore came before the harvest season, not after it. The concept of Satan would have been lost on such faiths, for whom the idea of a single Godhead - or it's Adversary - would have made precious little sense. The modern conception of ‘The Devil’, in any case – is an invention of the Mediaeval Christian church, again demonising the deities of older faiths. Honouring polarities of experience. Warn and Cold, Light and Dark, Good and Bad, Life and Death is pivotal to our understanding of the pagan Samhain, and how it evolved within Christian Europe. The light and warmth of the bonfire defied the cold and dark of the Winter, and just as offerings were made to the honoured ancestral dead, token offerings would also be made to less benign spirits. Efforts might be made to confuse or confound these malign entities. Frightening totems or lanterns might be placed around the house, or at doors and windows, to scare them away (as with the grotesques and gargoyles adorning Medieval churches). Donning masks, costumes and outlandish games and pastimes - 'Guising', as it is still known in parts of Scotland - was common practice for the same reasons. Death and malignity were acknowledged and aped by these traditions, but by no measure of the imagination celebrated. Samhain was one last-hurrah before the bitter Winter arrived, celebrating life and community before the bitter cold of Winter made such gatherings impractical. . Putting on a devil-mask and dancing around the bonfire was an empowering statement of defiance which reduced that evil-spirit to the level of a clown. Devising silly scares for friends and neighbours served the same function – fleeting frights, made in the full and certain knowledge that they have no real power to harm. The Vice or the Devil in Mediaeval Morality and Miracle Plays operates on the same principle. He’s gaudy. He’s grotesque. He’s funny. He tricks and taunts the foolish – and is defeated and mocked by the virtuous. He'll always escape to cause mischief another day, but if we have any sense we'll know him for what he is...because we’ve let-off-steam by laughing at the folly of those he’s gulled. In other words..."Yes, Death, I know you can get me and inevitably will - but that doesn't mean I have to be scared of you! Not here. Not now!" On these performances I’ve played all manner of characters drawn from local history and folklore. My most frequent persona is that of the 18th-century ‘Happy Hangman’, Jock Rankin. A killer. A wife-beater. A bully. A drunkard. Is that my true nature? Am I exercising any desire to play out those characteristics in the real-world? No. Anyone who knows me can testify (I hope) that the opposite is true. I have, I suppose - like all of us - the potential to be all those things, so it could be argued that by assuming his character I'm exorcising my own worst qualities. Caging 'The Beast in Me'? Does Jock’s persona encourage those qualities (sic) in others? Of course not: he’s a comic-grotesque, a buffoon and a caricature of immorality...easily identified as such. Which is, of course, rather the point. The historical Rankin was a vile drunk, sacked and banished from Stirling for his slovenly ways – a man so derided by his peers that his actual history was quickly supplanted by local legends that he (ironically, for a Hangman!) choked to death on a chicken bone and haunted the town as a punishment for his wicked ways. A convenient bogey-man often deployed by past generations of local parents to keep their wayward offspring away from dodgy parts of town. Immorality and cruelty punished. Dramatic irony. A Morality Tale, in essence -where the Vice is guaranteed to get his just deserts. You see the same in many of the tales we use on the Stirling GhostWalk. The preacher Blind Alick - to choose one example - rails against the drunkards and pub landlords of the town, but saves their souls by battling The Devil on the Ladies Hill - leaving the lushes to an enduring awareness of their folly and sin in mocking him. As concupiscently Calvinist an outcome as could be imagined. Morality tales steeped – like most of Scotland’s great gothic tradition, from Hogg to Stevenson – in the homilies of the presbytery. I’m part of a long tradition of storytelling, and proud to be so. I may not share the religious faith of many of the myth-makers who first fashioned these tales from the raw-matter of fact, but I am (again, I sincerely hope) a moral creature, and am happy to tell tales with a satisfying moral denouement. I’m happy, too, to say that in 25 years I don’t think anyone has participated in one of my shows and been inspired to sacrifice a virgin or dabble in the Dark Arts. To assume that anyone would be so blithely stupid as to mistake a popular entertainment – or a Festival celebrating a diversity of belief and experience – for an 'occult agenda' is, to say the very least, insulting the collective intelligence of the population, and demonstrates a pitiful lack of irony. Inevitably there will be people who confuse fact and fiction in this foolish way, but they are - I'm happy to say - considerably rarer than those who mock others for their beliefs without consideration or respect, or condemn tales or entertainments as 'corrupting' or 'morally degrading' blithely unaware of cultural context. Such people do not need inspiration to behave badly or with prejudice...they simply seek an excuse to do so. These days, in a largely secular society The Devil is already a creature of myth. Most of us are sufficiently self aware that we know that if we misbehave it is our own bloody fault or folly which caused our actions. The self-apologist argument that 'The Devil made me do it!' is, I'm glad to say, rarely heard. This Hallowe’en you are more likely to encounter costumed Zombies, Vampires, Hannibal Lecter or Freddy Krueger on the streets, but the principal remains the same. We ape the icons and the characteristics which scare us - not because we wish to emulate them, but because it is a time-honoured way to tame and to cage those beasts (real and imagined), through games, dressing up and make-believe. We bait the Bogey-Man, and laugh in the face of The Devil to rob the horny old b*****d of his power: We have fun at his expense. THAT is the point. The ONLY point. Always will be. Originally posted during the week of the first Scottish Paranormal Festival, in 2014, this essay was a direct response to brief but vocal criticism of the GhostWalk, Hallowe'en celebrations and the SPF.